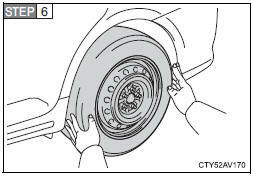 For vehicles with steel wheels, remove the wheel ornament using the wrench. 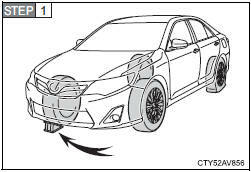 To protect the wheel ornament, place a rag between the wrench and the wheel ornament, as shown in the illustration. 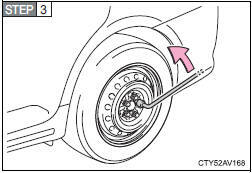 Slightly loosen the wheel nuts (one turn). 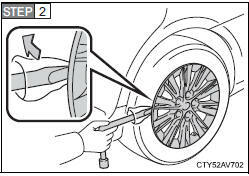 Turn the tire jack portion “A” by hand until the notch of the jack is in contact with the jack point. 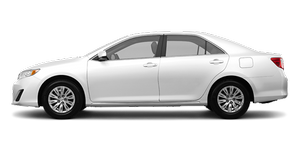 The jack point guides are located under the rocker panel. They indicate the jack point positions. 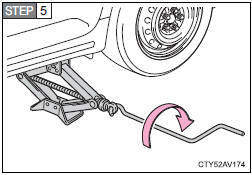 Raise the vehicle until the tire is slightly raised off the ground. 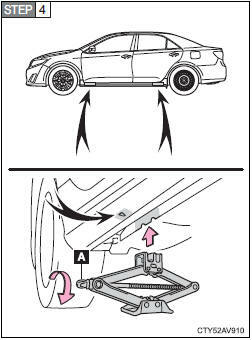 Remove all the wheel nuts and the tire. 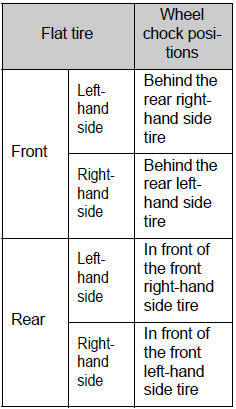 When resting the tire on the ground, place the tire so that the wheel design faces up to avoid scratching the wheel surface.